I’ll be leaving for overseas again in a few days. I’ll saythat this trip should be more relaxing than the last. And by relaxing, I mean being slightly less hectic than what my usual sporadic traveller self would deem appropriate, the former self that’s always found pleasure in an aggressive overload. Spending more time in my hotel room (which will likely be converted into a mini apartment during my stay), more photogenic walks, more writing in, more eating out. Less distraction, more focus. Oh, and pool time (despite living in a perpetually hot climate, the pool, is never something I make time for). All the things I rarely seem to do at 'home'. I’ve always said that when I travel, I become immersed in the moment rather than the pursuit of capture. Something, I deeplyregret from past travels. Because like all good things, the memories fade and all that’s left is melancholy blues and feelings of nostalgia. My body is riddled with intention to bring back a whole set of memory cards, filled to capacity with kaleidoscopic tropical sunsets, lush waterfalls and shots of good food between. Fingers crossed and here’s hoping that I share them on the blog too. So, for now, I’m leaving you with the recipe for these Dark Chocolate Merveilleux with Honey and Lavender. Merveilleux are little meringue cakes that are filled with a slightly sweetened whipped cream and coated in dark, dark chocolate shavings. I spied my first Merveilleux in a window display, rushing (of course) up 8th Street, after dining on things like roasted beets and yoghurt, pretzel dusted calamari and kale with lemon, serrano and mint at ABC Kitchen (a must if you’re in NYC). And was amazed that something so seemingly delicate could be so rough-handled and resilient. These Dark Chocolate Merveilleux with Honey and Lavender are slightly different from the original. 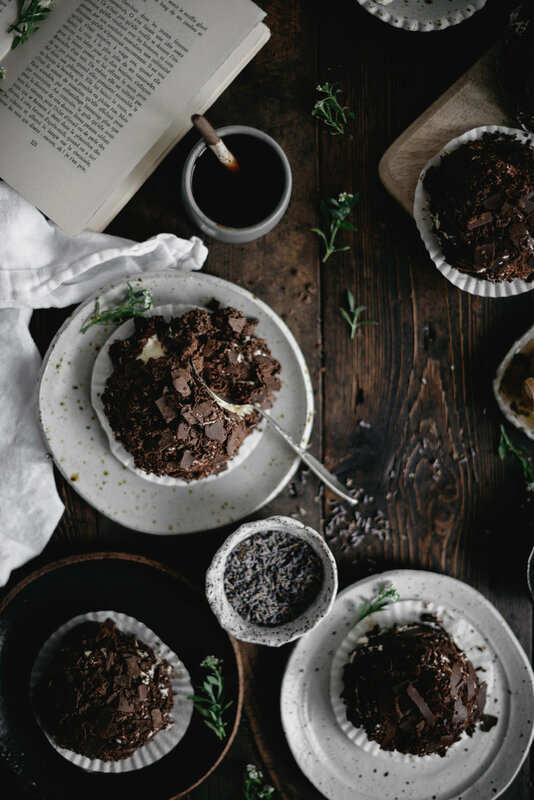 Two pale and crisp meringues are filled with a lavender and honey infused mascarpone cream (that’s also studded with flecks of vanilla bean) then coated in textured shavings of dark chocolate. They’re not too sweet, perfectly light. If you don’t have the lavender on hand, omit the infusion step, or simply replace it with something else (cardamom or espresso would work perfectly!). They’re excellent served alongside a cup of strong milky coffee or tea. Pre-heat the oven to 135 C (275 F). Line two large baking trays with parchment paper. Set them aside. In the bowl of a stand mixer fitted with the whisk attachment, whisk the egg whites, cream of tartar and salt on medium speed until the mixture is just beginning to reach soft peaks, about 3 to 4 minutes. Set the mixer speed to medium-low and add in half of the confectioners sugar. Whisk until just combined then add in the remaining half of the sugar. Add in the vanilla bean extract then increase the mixer speed to medium-high and whisk until the mixture forms a stiff, thick and glossy meringue. Fit a piping bag with a large round tip then fill it with the meringue mixture. Pipe the meringue into (5 cm (2 inch) round and 2.5 cm (1 inch) high) circles on the baking trays, making sure to space them evenly apart. You should get about 18-20 circles out of the mixture and fit 9-10 per tray. Bake, for 1 hour and 15 minutes, or until the meringues are crisp when touched. Turn off the heat and let the meringues dry in the oven as it continues to cool, about 1 hour and 30 minutes and up to 2 hours. When the meringues have completely cooled, immediately store them in an airtight container until needed, making sure that you space them evenly apart and do not stack them upon each other. The meringues can be made up to 3 days in advance. In a small food processor, or using a mortar and pestle, grind the confectioners’ sugar and dried culinary lavender until the lavender is roughly blended into the sugar and is beginning to smell fragrant. Set aside. In the bowl of a stand mixer fitted with the whisk attachment, whisk the cream on medium-low speed until it is just beginning to hold it’s shape. Add in the honey and lavender sugar and whisk until very soft peaks have formed. Add in the mascarpone, vanilla bean seeds and lavender water (if using) then increase the mixer speed to medium-high. Whisk until the cream is just beginning to hold stiff peaks. Be careful not to over whisk! The cream is ready when it is smooth and thick but not curdled. Remove the bowl from the stand mixer and place it in the refrigerator to thicken whilst you prepare to assemble the merveilleux. Using a box grater or peeler, shave down all the dark chocolate. I used a few different holes on my grater for a more textured look. Place the chocolate into a clean rimmed baking tray. Set aside. Place half the meringues on flattened paper muffin liners set on a seperate lined baking tray. Pair each meringue with another matching meringue that closely resembles its shape. Remove the cream from the refrigerator. Using an offset spatula, spread a thick layer of the cream on top of one of the meringue, spreading it all the way to the edges. Then, use a gentle amount of pressure to sandwich with the remaining meringue pair. You’ll essentially have a ‘meringue cake’, that comprises of a bottom layer of meringue, a thick layer of cream and a top layer of meringue. Coat the top and sides with another thick layer of the cream. If your cream is too loose, you can place it back in the refrigerator to chill for a further few minutes until it has firmed up slightly. Gently and quickly roll the meringue cake around in the shaved chocolate - dip the top, then coat the sides, then roll around in the chocolate to shape. The more you do it, the more it becomes less messy and natural! Place the cake on top of it’s paper liner then continue to repeat with the remaining meringues or until all of the chocolate and cream have been used up. You should get about 10 to 11 merveilleux. Place the merveilleux in the refrigerator to chill until firm before serving, about 1 hour.